It is January 25th, wha hae … and here’s a health to all as we honour the birthday of the great Scottish poet, Robert Burns. Originating from our student days in Glasgow, my husband and I have carried the traditions of Burns Night with us in our gradual migration to the South-West of England. In 1998, we celebrated our first Burns Supper south of the border with a party of vaguely bemused friends, a vast quantity of haggis and a large bottle of whisky. Ten years and three children later, we will still be celebrating tonight with haggis, neeps and tatties along with the essential single malt whisky (albeit in slightly reduced quantities to those of 1998!). 1. Track down a haggis (don’t believe those stories of wee hairy beasties roaming the Scottish countryside, one pair of legs shorter than the other since they spend their time spiraling steep slopes – try your local deli instead). 2. Remove any plastic covering. Wrap the haggis in kitchen foil (in case it bursts), place in a roasting dish and fill with water so that it reaches about halfway up the side of the haggis. Cook at 180 degrees C for about an hour or so until the haggis is heated through. 3. Peel and boil (in separate pans) your turnip (swede for those south of the border 😉 ) and potatoes … neeps and tatties. Mash. 4. Find someone to play the bagpipes for you while the haggis is cooking (warning: you’ll need to wear industrial-strength ear plugs if your rooms are small – I speak from experience, having survived a piper’s attempts to deafen all in the Uisge Beatha one Burns Night). Alternatively, put on some traditional music or hum a Scottish jig (Linn Records do a Robert Burns Series of CDs that are excellent). 6. … then play a rousing tune as you ceremonially carry the haggis to the table. This is called ‘piping in the haggis’. 8. 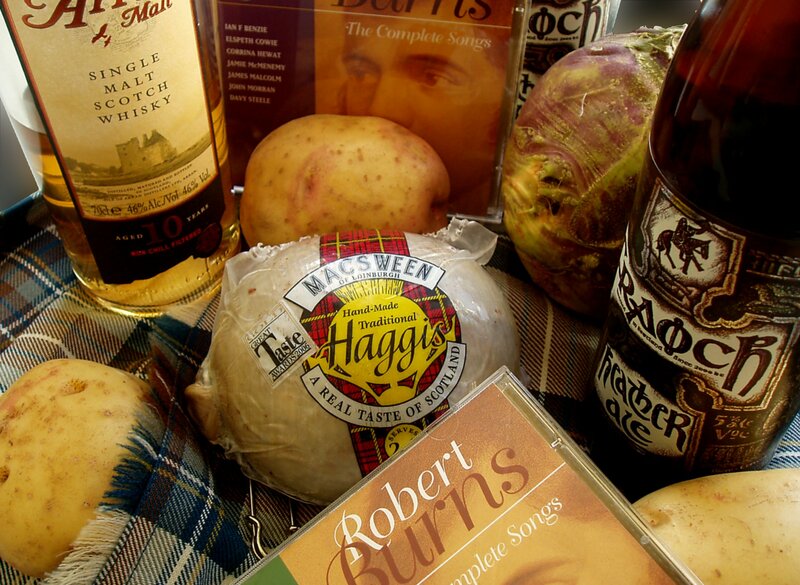 Raise your dram in a toast to ‘The Haggis’. 9. Eat and drink muchly. 10. Give a toast to ‘The Immortal Memory of Robert Burns’, celebrate his works with enthusiasm (one of my favourite songs is Kellyburn Braes) and wish a health to absent friends. Have you looked at Rose’s website recently, Kate? I just clicked on and found a video that Hector (I think) has put on of her recent lecture in NY . YOu are mentioned at the beginning of her talk and she goes into your experiment with flour and it leads to an interesting exchange with the audience. I am sure you will find it very interesting. Thanks, Jeannette 🙂 Yes, I downloaded the video yesterday and I’ve finally just managed to finish watching it (no mean feat with my children bouncing about!). I’m excited all over again and off to the kitchen to bake a cake! i am dying to try haggis–mostly bc i’ve heard such dreadful things about it and the name itself is so grossly unappealing. i wonder if it’s an acquired taste? bagpipes on the other hand was love at first sound. while jewish liturgical music is to my ear the most heart-rending, the bagpipes are the most haunting and almost scarey. guess what i found (i’m in the midst of reorganizing storage). a bag of mcdougals self-raising from about 18 years ago i’ve been saving to test my theory of allowing the leavening to disappate. i thought: time to go and as i lifted it out of the plastic storage bin i thought: no! kate will be disappointed. so one of these days i will try one of my cakes minus the salt (THAT doesn’t dissipate) but with baking powder and report back!